After a little over two years in our tiny flat, it’s time to say goodbye. We’ve signed the papers and handed in our notice, and in just over two weeks we’ll be moving out. It was a tough decision. 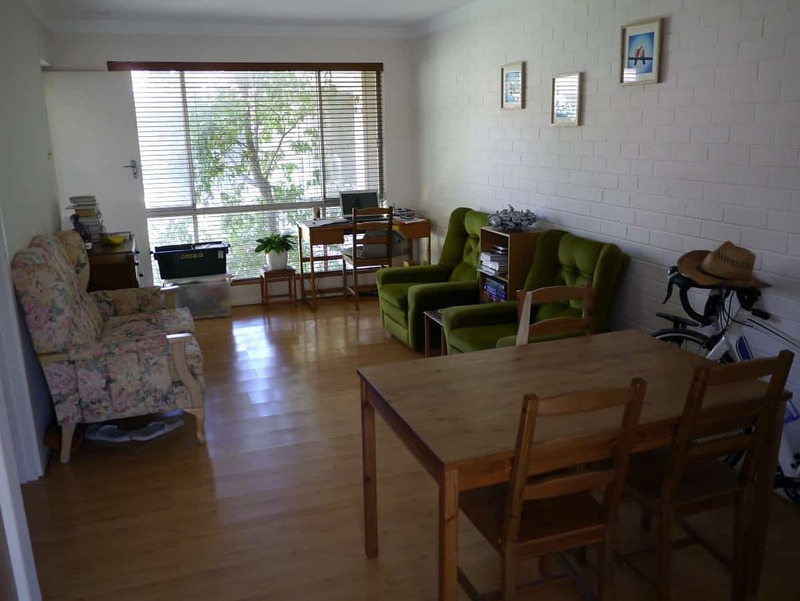 We really like our tiny flat, especially in the Australian summer. It doesn’t get any direct sunlight so it stays relatively cool, even when it’s above 40ºC outside (and in Perth in summer, that happens often). We like living in a small space, and it’s been an excellent teacher in living with less and making do with what we have. Plus we like the area; as we don’t have a car we chose this spot as it had excellent public transport links, and lots of facilities within walking distance. However, last winter was brutal. When you live in a flat that doesn’t get any direct sunlight, with gaps in the doorframes that cold air blows right through, huge panes of single glazed glass and a bathroom window that actually has a 3inch x 25inch gap with no glass at all, it gets pretty cold. Australia might be hot in the summer, but temperatures can drop to 0ºC overnight in winter. Brrr. Not only that, but when you have a cold flat, it gets damp. Last winter our bedroom (and everything in it) went moldy. Whilst we cleaned it up successfully (with no nasty chemicals) and the mould hasn’t returned, I was quietly dreading the possibility of having to deal with it again this year. There’s a couple of other things that are less than ideal. Our toilet/bathroom is en-suite, which makes it awkward when visitors come to stay. It’s too small to have more than a couple of extra people over at one time, and we’d like to have people round more often. It would be nice to have somewhere else to keep the bicycles rather than in the way in the bedroom, where I manage to fall over it at least once a fortnight. We ummed and ahhed about it for a while (it’s such a lovely place to live in summer that it’s hard to remember the horrors of last winter, but I remember saying at the time there was no way I could face another winter in this flat). The flat is inexpensive for the area, and moving is another expense. We decided that if the landlord didn’t put the rent up, we’d stay for as long as we could stand, and then hopefully find somewhere else. The landlord decided to put the rent up. We wrote to him to ask whether they would hold off for three months, to give us time to adjust. The job I was working on finished at Easter, so losing an income source on top of a rent increase was not ideal. We resigned ourselves to the fact that we’d have to start looking, and then something perfect came up. In our block of 16 units, only four are one-bed units. The others are two-bedroom, and our neighbour’s flat is one of these. This means it is slightly bigger, and the bathroom is not en-suite. It also has a big front balcony area with some natural light which means we might be actually able to grow some plants at last! Also, it’s not technically next door but across the passageway with a different aspect and far more natural light. In the 8 years our neighbours lived there, it never went moldy. Plus, it’s the same price! The downside? It’s not in such good condition as our current flat. Most of the features are original (read dated and falling apart). The kitchen is even less spacious than our current (and fairly tiny) kitchen. We’re really excited to be moving, though…and yet glad to be staying where we are. The best of both worlds. There’s nothing like moving house for the chance to declutter, either – and we intend to move with far less than we currently have. All those things that we’ve been keeping in case they turned out to be useful? Well, if they haven’t been useful in two years, perhaps now is the time to let them go. I can’t wait to see pictures of your new place and hear all about your decluttering! Moving is the best for getting rid of stuff. Good luck! Thanks! Yes, you’re right – nothing like moving for getting rid of things! It’s nice that you’ll be moving close by! A few years ago, we relocated to our new place, which was exactly a block away! It made for easy moving! We’ve been doing serious thinking about downsizing, which will greatly decrease the things we decide to keep around! I’m loving the idea of being able to carry things across. I can un-hang things from my wardrobe, walk over and rehang! Sounds so easy… I just hope it is! Lindsay, I look forward to seeing pictures of your new flat. One of the things I need when renting is good sun exposure. Winters are long here and with no sun I get depressed (SAD). I’m happy for you that you won’t need to worry about mold this year and hopefully the new flat won’t be as drafty. Our old flat is already starting to get cold. Yesterday I had the door wide open as it was warmer outside than it was in – not good when it’s still April and the coldest days are still to come! I’m pretty sure the new flat will be just as drafty, but the sunshine coming through the windows will be glorious! Hi, to you all from the UK, enjoy reading your blog and can understand the problems of the cold in winter. I live in a small bungalow end of terrace and it is elevated on a hill so the wind blows underneath through vent holes and it is freezing in winter. I keep saying I am going to move but trying to find somewhere which is quiet and does not have problem neighbours here in the UK is impossible. A lot of the smaller flats/apartments are not soundproof and seem to encourage transient tenants who have no respect for others. It is a big problem over here and spoils the lives of so many people. I have lived a simple life long before it became a necessity due to debt problems and the cost of living. It has been a lonely road to follow as I don’t know anyone who lives within their means or who understands why I don’t want to be a slave to debt. However, I am so glad myself and hubby kept on track as we are comfortable with everything we need and no debt. Having thrifty parents who came through a war helped. Thank you so much for your comment! It is difficult trying to weigh up whether to move – we had the same concerns as we really like our neighbours here, and it’s a quiet block of units. We didn’t want to move and end up with noisy/mean neighbours! But the cold can be miserable too. Hopefully you haven’t had mold or damp problems though…? We do have to be careful with condensation problems which cause black mould especially in the corners of room. A dehumidifier would help with this but I am loathe to use even more electricity. However I do keep on top of it by airing the place out regularly. I know our newer built previous house had no such problems, but there was more room for it to evaporate. I expect my batch cooking for the freezer does not help but we both love to be able to go to the freezer and get a home cooked meal out which we know has no chemical in it. We bought some calcium chloride crystals to put in our wardrobe – they sit in a basket above another container and over time absorb water which collects in the bottom container. Cheaper than a dehumidifier!